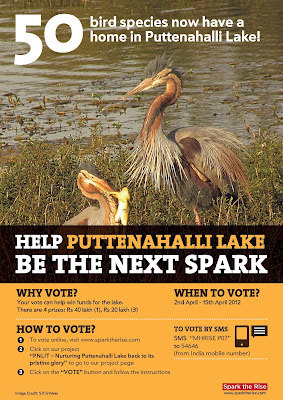 Puttenahalli Neighbourhood Lake Improvement Trust (PNLIT) is trying to raise money for the recently revived Puttenahalli Lake through the Mahindra Spark the Rise competitive funding. The entry "PNLIT – Nurturing Puttenahalli Lake back to its pristine glory" is to serve as a template for reviving lakes with active public participation. 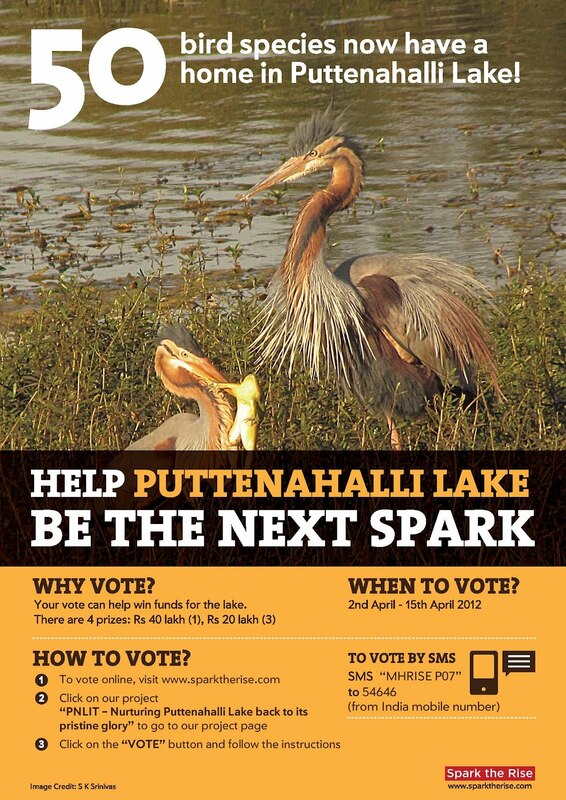 Your support in the December preliminary round of voting, helped Puttenahalli Lake win a grant of Rs 4 lakh from Spark the Rise. Now a large amount of additional funding is at stake in the Grand Finale of Spark the Rise. Your vote can help win funds for the lake. There are 4 prizes: Rs 40 lakh (1), Rs 20 lakh (3). 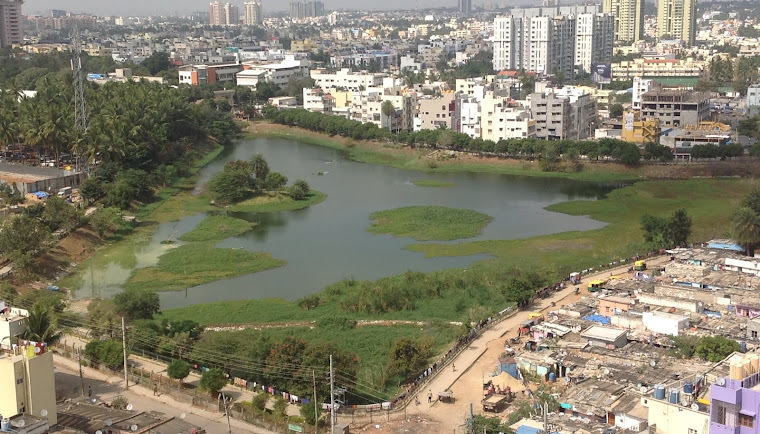 Puttenahalli Lake, like the other two lakes in JP Nagar was dying till a few residents campaigned to save it. In 2010, the BBMP began restoring the 13-acre water body that lies between Brigade Millennium and L&T South City. In May 2011, the BBMP handed over the lake to PNLIT for nurturing for 3 years. This Puttenahalli Lake is sometimes confused with the significantly bigger Jarganahalli Lake near Elita Promenade (that is also called Sarakki Lake/ Puttenahalli Lake) and the Yelahanka Puttenahalli Lake. Namma Bengaluru's first citizen caretakers of a lake! Is instrumental in giving a new lease of life to a lake; a home to over 50 species of birds in an around the lake! Why does PNLIT need funds? PNLIT has been officially handed over Puttenahalli Lake for nurturing, for a period of 3 years (May 2011-2014). While the restoration of the lake was done by the BBMP, PNLIT receives no government funding. The day-to-day expenses of the lake are being met primarily through individual donations. Apart from the routine expenses, PNLIT has some investment requirements and ideas to improve the level and quality of the water of this rain-fed lake, make it a secure bird habitat and an enjoyable Public Open Space, through citizen participation. PNLIT has other eco-initiatives - promotion of cloth bags, waste management, nature walks and other programmes for the improvement of environmental sensitivity. 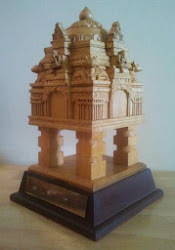 The aim is to make the Puttenahalli Lake Model replicable at other lakes and Public Open Spaces. Boating survey in Puttenahalli Lake!